I can't believe it's taken me as long as it has for me to start watching Downton Abbey. I remember hearing about it years ago at this point in an article talking about people having viewing parties. The concept of the show caught my interest but I suppose I forgot. Truth be told, it's been on my list of things to watch since then. I love a good English period drama. (The Young Victoria, anyone? Emily Blunt was perfect.) Last month after scrolling through a sad selection of movies on Netflix, JD and I decided to finally sit down and watch it. I fell asleep about fifteen minutes in. JD thought it was excellent and stayed awake. He finished the first season within a matter of days. Unaware of this, I politely waited until the weekends to watch again, with him. It took me a while, but I finally finished watching the first season last Tuesday. Over the course of the season, I have formed opinions of each of the characters. There are characters I've disliked from the start (O'Brien), and others that have grown on me (Mary). Let's start with the ones that should fall down a well, shall we? O'Brien - Oh my goodness, this one just gets worse the more we see of her. I wonder what she's got to be so nasty about. She is never pleasant, ever. Don't get me started on the soap incident. Thomas - Why does he hate Mr. Bates so much? I'm happy to see him "leave" but doubt he'll exit the story entirely. Edith - It's all about Mary, but to write to the Turkish Ambassador to spread rumors about her sister? That's over the line. I wonder what will happen when her mother finds out. I did feel sad for her at first, always overlooked, and without looks, but now not at all. Not even when Mary ruined her potential engagement. Daisy - The poor girl is all over the place. She'd follow a flock of sheep off of a cliff. I hope to see her character grow more of a backbone. Mary - At first, I hated Mary. She's a snob and has more than a handful of wicked tendencies. But her character has changed over the course of the season. She's tarnished her reputation and possibly lost a man she actually loves for once. She has begun showing much more humanity. And, I should probably mention cheered a little when she dashed Edith's engagement. She deserved it. Anna and Mr. Bates - can't wait for them to become a real couple. Sybil - I like Sybil best of the sisters. She seems to be the most normal of the three and doesn't participate in Mary and Edith's war. Though her political nature is cause for concern, I think the real drama will come when Sybil finds a husband before Edith. 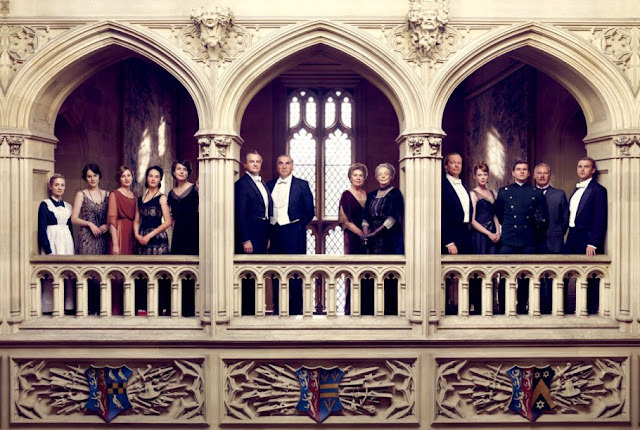 Lord and Lady Grantham - They just seem like nice people, always looking out for everyone's best interest. It's so sweet that they sleep in the same bed (for the time period and their social status) and like each other so much. We're currently working on watching Season 2. I'm hooked! And you can't forget the Dowager Countess! "What is a week-end?" is one of my favorite lines from the entire show. arwwww. i hate that it isn't in the program in germany!! i tagged you for my "the best things - project"
i would love if you'd be a part of this! !